To introduce Arcade Park and ABC Puzzle, we are offering a $14.95 SPECIAL LIMITED TIME OFFER for this version! Click here to order now! Arcade Park is a remix collection of the seven great golden oldest arcade games such as Arkanoid, Asteroids, Black Shark, Digger, Lode Runner, Pac-Man and Ping-Pong. 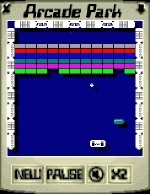 ABC Puzzle is a remix collection of five puzzle and logic games such as Blocks, Lights, Lines, Sokoban and Tetris. Welcome to our game ordering page! You're just a few clicks away from joining our thousands of happy customers.